As data journalism evolves, so have our methods of teaching it. Image courtesy of startupstockphotos.com. In recent years, journalism schools everywhere have been scrambling to teach data journalism and visualization to address the burgeoning demand from newsrooms trying to help the public understand a transformed world that the New York Times has described as “awash in numbers.” The City University of New York (CUNY) Graduate School of Journalism is one such school, where I established and led their program in data journalism from 2012 to 2015 along with Amanda Hickman, now the Senior Fellow at BuzzFeed’s Open Lab. Through seven semesters of continuously evolving tools, assignments, and instructional approaches, I’ve come away with some reflections to share with other instructors tackling this wide-ranging discipline. 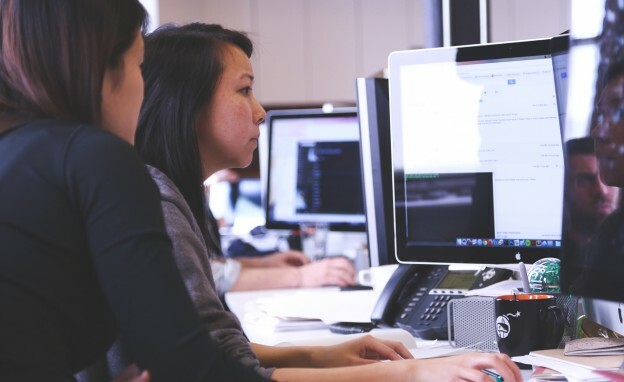 Other data journalism educators have written about what works for them, from summarizing the essential data tools, to ways to prepare and approach a dataset, to narrowing classes to focus on just a few datasets. Here, I chronicle where we started and how we ended, and the rationale for the decisions. While the goals of the course remained unchanged, much of the course structure, assignments and toolset evolved. These are the lessons I learned. "There’s value in not restricting a student’s thinking to conventional forms and getting them to spend time with pencil and paper." The first iteration of the course required three team assignments, which I had categorized as: a “numbers” assignment, a “crowd-sourced” assignment, and a “media-based” assignment. The numbers story had students reporting and finding stories in newly released published data. The crowd-sourced story required students to gather their own data from surveys or to collect data themselves from scraping the Web. The media-based story was an ambitious attempt to get students to quantify other media sources such as text, sound, video or images. We quickly ditched efforts to constrain the stories either by the kind of data-gathering or data source, and our latest syllabi required only three stories — two in a team and one as a solo effort. It seems obvious now, but we had much stronger, more coherent packages when students pitched stories that were inherently interesting with news value, rather than stories which satisfied requirements of form — say a “map” story or a “chart” story. Students still had to reckon with the fact that we were telling data-driven narratives, but starting with the story allowed them to explore the data approaches and visualizations that would effectively carry their story. Tempting as it might be to teach mapping techniques, and then have the students go out and report a “map” story to practice those skills, that approach deprioritizes basic storytelling by putting form over content. 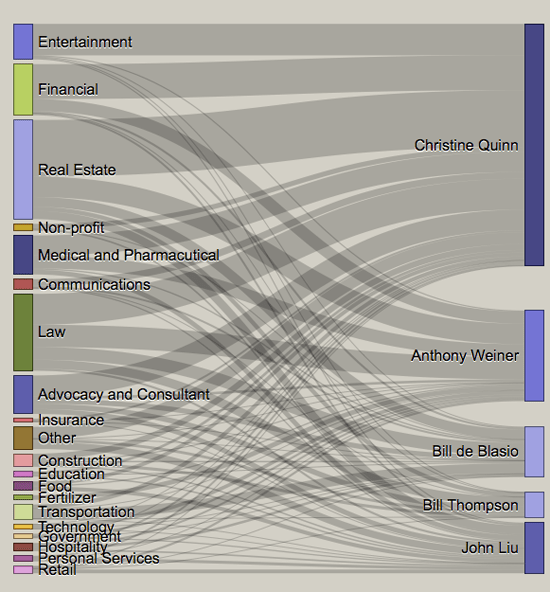 Visualization from a student story on campaign bundling in the 2014 New York City mayoral race. Courtesy of Nick Wells and Jessica Glazer. For many students (and some news outlets), using data for a story is entirely new. So understanding what a data-driven story looks like and knowing what our expectations were was new territory. We had no word count requirements, and in fact, some of the weakest stories were ones with too much text. We didn’t want long posts with an accompanying graph, but instead, stand-alone visualizations that drove a narrative. We also learned to be very specific on the deliverables required at each stage of the development process: the pitch, storyboard, rough draft and final. 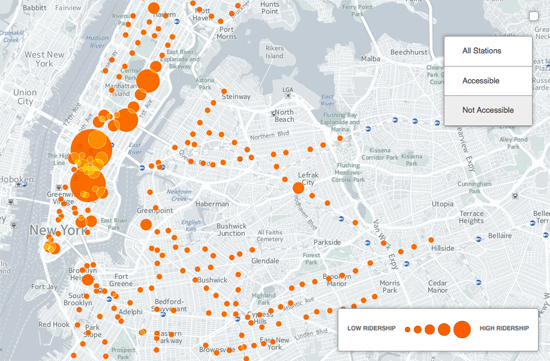 Mapping accessibility in New York City’s subways, a student visualization made with CartoDB. Courtesy of Ben Brody. One of our successes that has been part of the course since the beginning was what we called a Festival of Data. At the start of each class, a different student critiqued a data visualization that they brought in. It served as an ice-breaker to get the class warmed up and talking about data, but it also forced them to be constantly on the lookout for successful (and not so successful) examples in the wild. The exercise helped hone their judgements and at the conclusion of the course, we had a nice collection of data-driven stories and commentary. A key takeaway from our experience is realizing the need to inspire students about data and data visualization. For our own course enrollment requirements, we had to motivate students who wouldn’t ordinarily think about taking a data course. Sandeep Junnarkar, the director of Interactive Journalism at CUNY, noted that many students are more naturally drawn to other types of storytelling, like visual or audio, despite the hype about data. “I just don’t think most students are aware of the power and the capability of data and data visualization, “ he said. “It’s a far more complex storytelling.” Educators can address the issue, Junnarkar suggests, by creating smaller venues and more intimate approaches such as setting up individual data mentors and informal clubs for more casual and personal interactions with data reporting. Like all instructors, each year I learn how to teach the course better, and the latest syllabus reflects these improvements. Russell Chun is an assistant professor of journalism at Hofstra University School of Communication, where he teaches multimedia storytelling and data journalism. Twitter @russellchun.